Safely end the dangerous practice of texting while driving with tXtBlocker™. where and how your cell phones can be used. Locate phones in real time and customize your settings through our online map interface. Set up No-Cell Zones to limit distractions at school or in the workplace. It allows you to automatically reply to texts when you’re driving, silence your ringer. 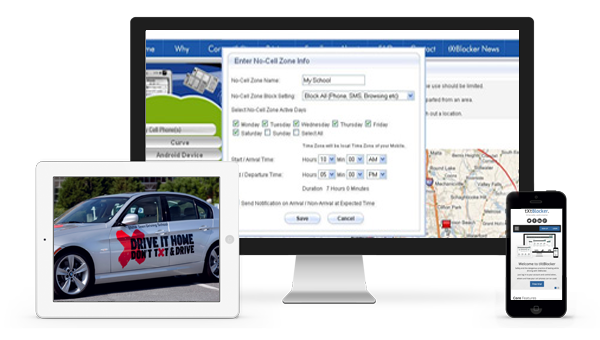 The ability to monitor and receive reports on driver behavior, including drive time, speeding, past location history. Unlimited Access to phone location information via the dashboard. Unlimited No-Cell Zone alerts via email. Unlimited 24 / 7 live chat support. Last 30 days of location history via tXtBlocker™ dashboard. “Consumer Reports’ statement that txtBlocker is the most effective anti-texting product they’ve tested is flattering, and highlights the ease-of-use and added functionality of our product amongst competing solutions,” Stan Van Meter, president of United Efficiency, Inc.
99.9% Uptime // Unlimited 24 / 7 live chat support // Plans from $6.99/month // Start your Free Trial Today!